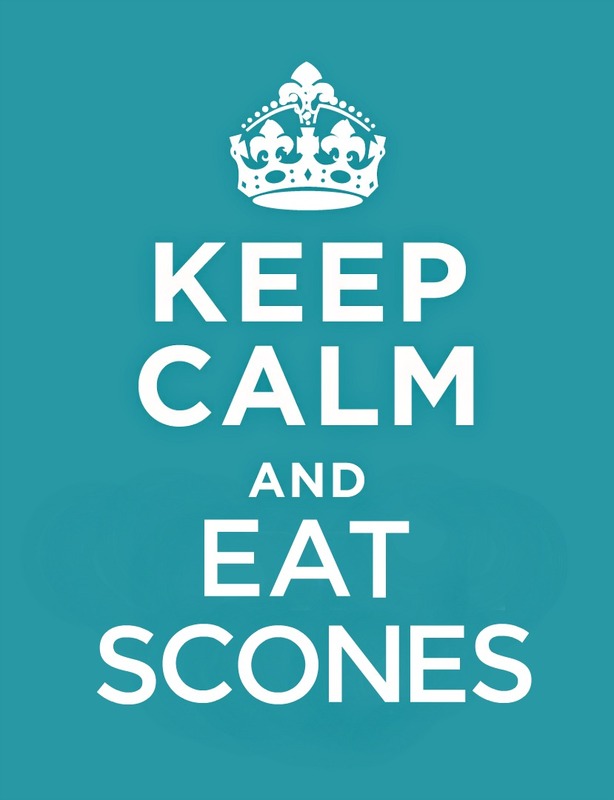 Keep Calm and Eat Scones. That’s a slogan I can live with. I post lots of scone recipes because I really love them and think you might too. Scones are especially good with hot coffee or cup of tea for breakfast or as an afternoon pick-me-up snack. They don’t require getting out the mixer but rather made in a bowl and tossed with a light hand. In a large bowl, stir together flour, baking powder, baking soda, and salt. Cut in butter until the mixture is the consistency of coarse crumbs. In a small bowl, beat egg yolk (reserving the white) with honey and buttermilk until blended. Add the buttermilk mixture to the flour mixture, stirring lightly only until dough clings together. Using floured hands, lightly shape dough into a flattened ball. Roll or pat out on a floured board or silpat baking mat, to a circle about 1/2-inch thick and 8 1/2 inches in diameter. Using a floured knife, cut 8 or 12 equal wedges. Place slightly apart on a greased or non-stick baking sheet. In a small bowl, beat egg white slightly to a froth. In another bowl, blend 1 tablespoon sugar and cinnamon. 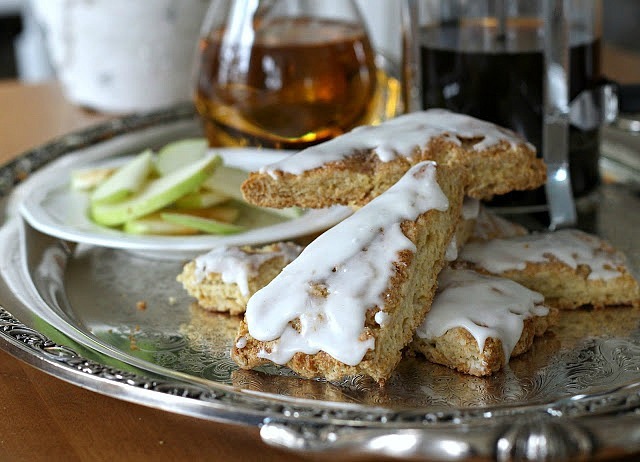 Brush scones lightly with egg white, then sprinkle them with the cinnamon and sugar mixture. Bake for 10 to 12 minutes, or until golden brown. Serve warm. 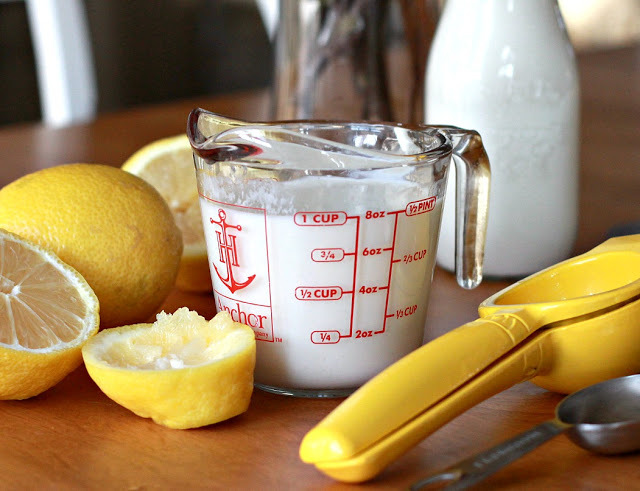 * To make buttermilk at home, measure 1 Tablespoon of fresh squeezed lemon juice or 1 Tablespoon vinegar into a glass measuring cup. Add enough milk to make 1 cup total liquid. Stir to combine and let stand for 10 to 15 minutes. The mixture will begin to thicken and curdle. Use as needed in recipe, or cover and refrigerate until needed. For convenience or if you are a beginner baker, I am sharing affiliate links to products that I actually use in my recipe preparation. 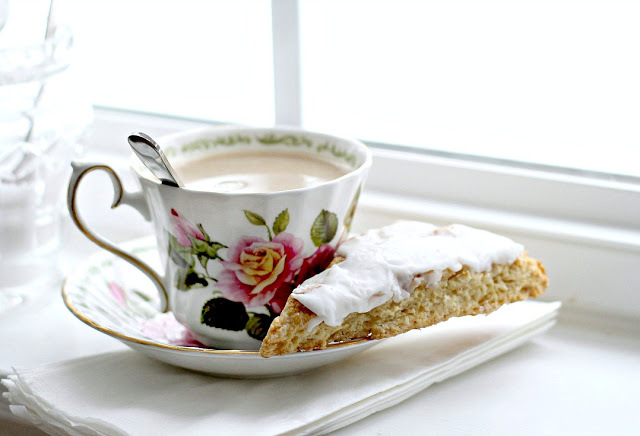 Your teacup accompanied by the scone make a very attractive pair! Scones are so yummy! Thanks for the recipe. These would be lovely for a brunch! I have never made scones. 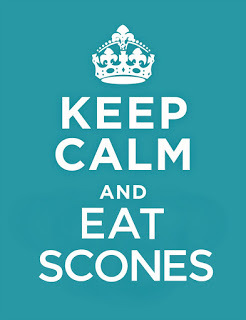 I love scones, too. Thank you for sharing the recipe and the beautiful photo of the finished scone. Have a nice week. These scones look wonderful! Lovely cup and saucer.